Today would have been my father's 94th birthday. As you probably (or might) remember, he passed away about four months ago. We had a really good relationship. I don't know it was a great one, but I don't think that the fault of either one of us - just a generational thing. Since he married later in life, he had kids later in life. And since I was a probable mistake second to last of the children, there is even a bigger age gap. There was the generational way fathers were "back then". My father was born right after WWI. Yes, the Great War. He served in WWII. I have found, while Tom Brokaw might call that age "the greatest generation", that is just not completely true. They are a stoic bunch. They are stubborn beyond belief. And they're not really good at communication. They never talked about the horrors of war. They never talk about their health unless absolutely necessary and even then, they downplay it all. That's not to say it is not a privacy thing, they just don't want to impose. My opinion, of course. I do not see this as a fault - trust me. Or at least, not his fault. TV fucked it up for our generation - and those after. No father was really like Ward Cleaver, Robert Young or even Mr. Eddie's Father. I don't know if talking about your feelings, or talking to your children about their feelings was a considered a sign of weakness or not. My father's upbringing was one where his parents were somewhat distant, which was kind of the style of the time. He was raised as much, if not more, by the help as he was his mother and father. It is my assessment that he had no good examples on how to be a hands-on parent. And let's face it, back then, mothers did most of the child raising anyways. My father and I got along better then fine - unless playing golf together was involved. Then there were just hurt feelings....meaning mine. And he loved 710 - so that was enough for me. While I clearly loved my father, I can't say now how often I thought of him. It is just one of those things you somewhat take for granted. You dealt with each other when you needed or on visits - though those were weekly. I can easily say, for the last year, and certainly for the last four months, I have thought about him daily. Probably several times per day. Before his death, it was just helping coordinate his care or checking on his well-being. Since his passing, it's just been random thoughts, but they happen daily. All of this is uncharted territory for me. None of it is a bad thing, just an observation I've had over the last few weeks. 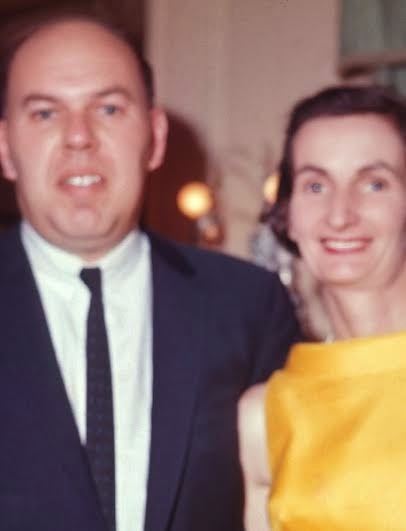 Tomorrow, on my mother's 86th birthday, we will raise a glass to my father.....and my mother. Having both of those days so close together, along with the holidays, will make it impossible to forget him......and his day. I get that could be emotional for many - and it might be. But if nothing else, it is a great way to remember him and bring a smile to people who knew him. a toast to both your parents; mazel tov! It's a difficult relationship at best. Cheers, though, to your dad, and to your mom! I really enjoyed this post and your honesty. I hope your celebration will be joyful. this was touching; thank you for sharing it.